So you’re ready to take the plunge. By enrolling in your first yoga teacher training (YTT) program, you’re diving into the profound ocean of yoga. Congratulations! You’re about to embark on a lifetime journey of personal growth and learning. With yoga’s increasing popularity has come a plethora of new teacher training programs. But faced with endless options, how do you decide which one to join? Here are six questions and thoughts to guide you. 1. What are the teacher and culture of the studio like? Do you know the teacher personally and have you taken classes with him? Is he approachable? Does he seem humble, genuine, and down-to-earth? Does he still practice? Or do you get a guru vibe? We’ve all seen it: the teacher who enshrouds himself in mystery, is inaccessible, impossible to relate to, and has access to knowledge you couldn’t possibly access yourself. Definitely do take classes with the teacher before you take her training. Reach out to her. Notice how she interacts with you and with others. If the studio or school offers an information session, go to it. Yoga was traditionally passed down from teacher to student in an intimate and personalized way. Today, there are teacher trainings that have space for hundreds of students. Consider how important it is to you to develop a personal relationship with a teacher that you respect and admire. When you learn from a teacher, you are also learning from their teachers, especially in yoga. You are plugging into their network. The best yoga teacher training programs involve a whole community of yoga teachers. Seek out a training that involves visiting teachers who have studied their area of interest in depth. 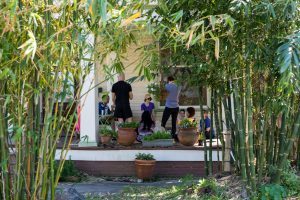 Community is a vital component of yoga. Consider this before traveling for a training program. It is well known that teacher trainings are an important source of income for yoga studios. Is the person offering it looking mainly to make money or to build community? Don’t get me wrong, there’s nothing wrong with making money. Skilled yoga teachers offer a valuable service that is under appreciated economically. But is money the studio’s main goal in offering a teacher training program? This is something to consider. A community-focused studio will offer work trades, apprenticeships, and community, donation-based classes to make yoga more accessible. These offerings are a sign that the studio owner/teacher is committed to sharing the practice of yoga and making it accessible. 2. What about yoga are you particularly drawn to and does the program offer it? The yoga cosmos is vast. What you learn in a 200-hour training is just a drop in a very deep bucket. With that in mind, what excites you most about a teacher training program? Philosophy? Anatomy? Sanskrit? Meditation? History? Ayurveda? Do your research on the programs you are interested in. Contact the teacher offering the training or people that have taken the training in the past. There’s only so much that can fit into a 200- or even 500-hour training. Find out how much the program focuses on the areas you are interested in. You should also find out if it is a well-rounded program. You should come out of a 200-hour training with a little knowledge about a broad range of topics. But, you should definitely come out of your first training able and confident enough to teach a hatha yoga class safely and competently. Ultimately, it is a lifetime of consistent practice and continuing education that makes a great teacher. 3. Does the program offer training in a style you enjoy? 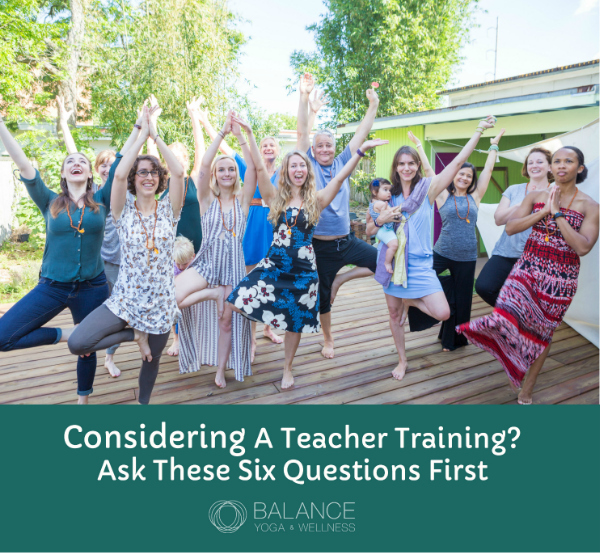 By the time you decide to enroll in a teacher training program, you have probably dabbled in many different styles of yoga. By now, you have an idea of what you are drawn to. Whether it’s Ashtanga, Iyengar, Anusara, or any of the multitudes of styles that have cropped up over the years, find out what the teacher’s background is and whether her program offers a style that you’re into. 4. How important is it to you to start teaching right away? If it’s important to you, you may want to see if the school or teacher you train with has the means and volition to offer teaching opportunities to graduates. It will be easiest to start teaching somewhere where the studio owner already knows you and where you are already part of the community. But don’t let it be a deal breaker if the studio can’t offer you this opportunity right away. You can always offer yoga to the community in non-traditional ways or get started subbing for established teachers that you know. 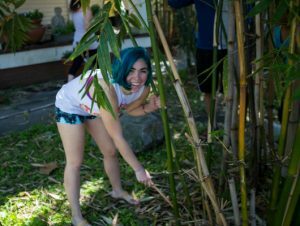 Building relationships within your city’s yoga community is the best way to land teaching jobs when you finish your training. 5. Is your school registered with Yoga Alliance? A Yoga Alliance credential may be important to you if you are seeking to teach in a non-studio environment. As yoga is becoming more popular and more and more studies are being published on the benefits of yoga, non-traditional environments like substance abuse recovery centers, veteran’s organizations, and businesses are seeking qualified yoga teachers. A credential from a governing body like the Yoga Alliance may signal to these types of organizations that you aren’t just walking in off the street claiming to be a yoga teacher. If your program of interest is not registered, do find out why. 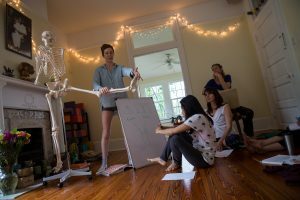 There are great trainings that opt out of the Yoga Alliance credential, and you should ask the teacher for a syllabus of the course before you enroll and see how it measures up to the Yoga Alliance’s standards. And remember, being registered with Yoga Alliance and even completing any number of hours of training isn’t ultimately what will make you a great yoga teacher. Don’t expect to quit your day job at the end of your training. Before you make this investment, consider what you want to get out of it financially. Teacher training programs can be expensive, averaging around $3000 for a 200-hour training. A yoga teacher training program will likely not pay off financially, especially in the short term. Don’t enter a program expecting to sustain yourself through yoga teaching. To make a living through teaching yoga, you will need to work hard, build a network of connections, and devote tons of time and energy. The full-time yoga teachers I know have spent years cultivating their community, their offerings, and a body of students. And it’s still a hustle for them. Sure, there are some social media yoga celebs who hit it big right after a 200-hour training, but their situation is not the norm. Consider whether you are willing to teach for free or by donation when you finish your training. You could do this out of your own home, at the park, or at a donation-based studio, and it’s a great way to get experience and build confidence in your teaching practice. Just make sure that your labor isn’t being exploited for someone else’s personal profit. Finally, if you are anything like me, when you graduate, you will have TT withdrawal and feverishly search for new learning opportunities. There’s no need to rush. Yoga is a lifelong pursuit. It works slowly and deeply. Seek out apprenticeships. Develop relationships with teachers you respect and admire. As you grow in your practice, you will become more discerning about where you invest your money in additional training. But do continue learning and most importantly, keep practicing! Why the Balance 200-hour Yoga Teacher Training? 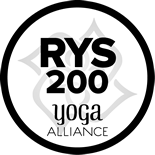 We are fortunate in New Orleans to have several great yoga teacher training offerings. I graduated from the Balance Yoga and Wellness 200-hour teacher training and I fully recommend this program. I have to admit, I did not really consider any of the above questions before I enrolled, but there’s something to be said for going with your gut. I couldn’t be more thankful for the education and community that Balance offers and that I continue to share in daily. The following are some highlights of the program. Community – Balance’s program is intentionally small, capped off in the mid-teens. As a result, during the training weekends, you will form a tight-knit bond with your co-learners and teachers that you will look forward to returning to every month. The learning sessions are organized into weekend retreats where you learn, practice, and dine as a group. The program features modules taught by teachers from the community who have devoted their time and energy to teaching specialized styles and various populations. You will also be plugged into the global yoga community through intimate learning sessions with world-class experts in yoga, pranayama, and anatomy. 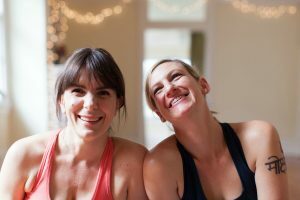 Honesty – Jessica and Mikhayla are relatable and committed to sharing their love of yoga. They honor transparency. They are upfront about their level of knowledge and areas of expertise and will not presume to teach you what they don’t know. The program is the culmination of their combined decades of practice, learning, and teaching. They come to the table with an impressive depth of knowledge and humility. They teach in a safe way that is nurturing to each individual and encourage every student to practice and live in a healthy and intelligent way. 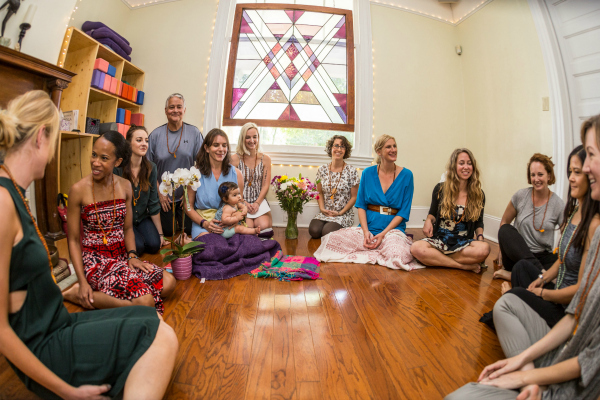 Knowledge – Balance’s program is unique in that it offers substantial training in Ayurveda, pranayama, and the traditions of alignment-based and Ashtanga yoga. Jessica is a certified dietician and Ayurvedic practitioner and is an Authorized Level 2 Ashtanga teacher (by KPJAYI, the official Ashtanga institute). She has also studied extensively with Sri O.P. Tiwari, the world’s foremost teacher of pranayama. Mikhayla, an Anusara-inspired yoga teacher, has taught for more than fifteen years. She shares her extensive experience in the fields of education and art by teaching trainees how to sequence, plan, and execute classes in creative, compelling, and intelligent ways. She has inspired students to approach yoga with intense curiosity and joy for many years. Both teachers enjoy sharing their knowledge and do so generously. Credentials –The Balance YTT program is registered with Yoga Alliance and goes above and beyond the standards set by Yoga Alliance. Practice teaching is interwoven throughout the whole training. By the end of the program, you will feel confident teaching classes and will have the opportunity to use the space for practice teaching and developing your own unique voice and style. Balance also has a community of experienced and knowledgeable teachers open to accepting graduates for apprenticeships in various styles of yoga. Ready to take the first step on your journey? Apply to the Balance Yoga 200 Hour Training. Michael Bick is a bartender, writer and yoga teacher. He encourages people who think they’re too stiff and unfit to try yoga to stretch past their own limitations. 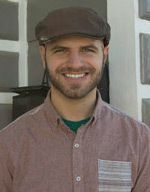 After completing the YTT at Balance Yoga & Wellness, Michael continued his studies in apprenticeships in therapeutics with AJ Durand and Ashtanga with Jessica Blanchard. Build confidence and strength when you check out one of Michael’s classes at Balance Yoga & Wellness Mondays at 4:30pm or Wednesdays at 7:30pm.